This picture is undoubtedly one of ufology's most interesting and genuine UFO photo cases. 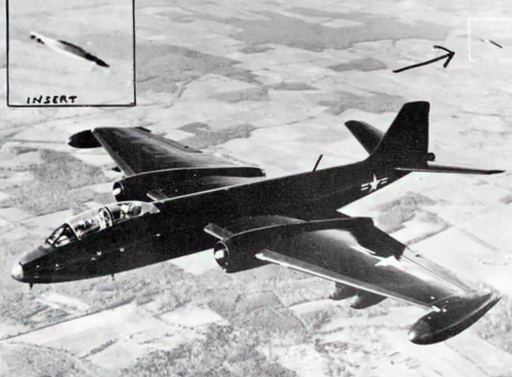 It was taken by professional photographers from the Martin Aircraft Company (which later merged with the American-Marietta Corporation and the Lockheed Corporation to eventually become what is now Lockheed Martin) for a promotional shot of their Martin B-57 Canberra bomber. The bomber was flying near Edwards Air Force Base in southern California sometime in 1954. This photo was leaked to the UFO organization NICAP.